Wow. I didn’t get the chance to put this up yesterday, so it’s better late than never! As some of you know, over the past month, there have been a couple of incredibly driven New Zealand writers pulling together an Anthology of Short Stories for Earthquake relief. This is an amazing opportunity for you to donate to Red Cross Earthquake Appeal – and get something really special in return. 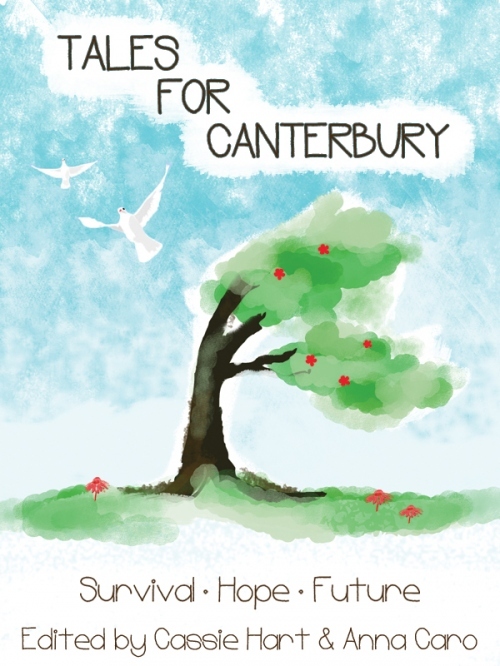 Tales for Canterbury is an opportunity for readers everywhere to give support to the people of Christchurch, who have shown resilience and bravery as they work to rebuild their lives and city. This charity anthology features tales by more than two dozen writers from New Zealand and beyond who have generously donated their works. We are now taking pre-release orders for this volume of inspiring works. If you wish to pre-order a copy, you can do so directly with the publisher, RandomStatic. This book will be released in hard copy ($24.95 incl. postage), as well as e-book ($12.00), and printing is expected to start in April. All profits will be donated to the NZ Red Cross Earthquake Appeal. See Tales for Canterbury for more details. Tales for Canterbury brings you a variety of stories set in both contemporary and future times, worlds touched by disaster, magic, and the otherworldly, where everyday truths are explored, and you never know what shape the future might hold. Explore the depths of what it means to be human, escape the real world, and find hope in these pages. If you wish to send out to your networks, then please do so. We want to raise as much money as we can! Whilst Cassie and Anna talk about resilience and bravery, I am truly amazed at the shear drive and passion that these two women have for this cause. The incredible amount of coordination in getting something like this together (in just one month!) is amazing. This has been a big process for both of them, but the resilience and bravery that these two women have displayed throughout this journey is inspiring. Even if you can’t help out financially, drop them an email or a message to show your support. I know that it would mean a lot to both of them. aww, thank you for the kind words, and for blogging about the anthology. The line-up is awesome, and I think there is something to appeal to everyone in there. Well! I can’t wait to read it. Super-looking-forward to it! Well done for all your hard work. Soon you will be able to feel, and hold the fruits of your labour.